You'll be £6.00 closer to your next £10.00 credit when you purchase Beyond Peterloo. What's this? ELIJAH DIXON played a key role in the Blanketeers' March of 1817. Arrested, chained in double irons and imprisoned without trial, the episode set the stage for the Peterloo Massacre. Everybody in Victorian Manchester knew of Elijah Dixon. Over a period of sixty years, he was an ever-present force in the tumultuous politics of the town. He worked alongside the great figures of nineteenth century Radicalism, and as 'The Manchester Man' he became the town’s ambassador for Chartism. An early apostle of votes for women, Temperance advocate, Christian convert, Dixon rose from poverty to make a fortune as Britain’s first mass-producer of matches. In Beyond Peterloo, Robert Hargreaves and Alan Hampson bring Elijah’s previously overlooked yet vital contribution to social reform to life. 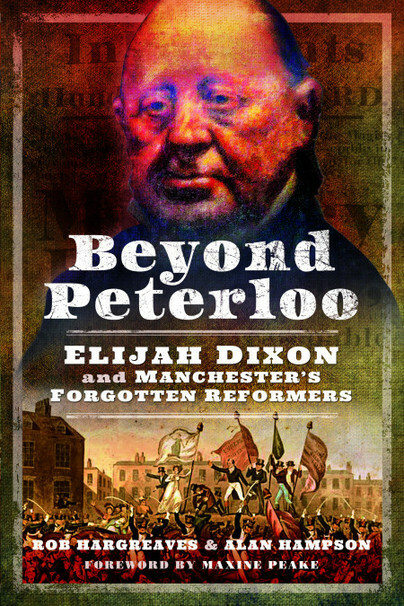 Set against the backdrop of the Blanketeers' March of 1817 and the Peterloo Massacre of 1819, they reveal the fascinating story of his life and work as Manchester’s forgotten reformer. As someone who has been active in investigating Manchester’s history this book will add to the historiography of the city. It will inform many, a starting point for other to begin their own research. Manchester has been crying out for this book for years and is a very welcome addition. The book is very well researched with a lot of historical content. Their stand for a fairer system and rights for the working class was long and hard and they suffered many hardships during their quest to improve living conditions of the ordinary man and woman. An ideal book for any historian that wants to know about times past. I was aware of the poverty in past years. This book brings it home just how much we own to Elijah Dixon and these reformers. Very well researched giving lots of facts I was not aware of. Well done Hargreaves and Hampson.